Democrat Mark Begich (left) has claimed victory over Sen. Ted Stevens of Alaska. (CNN) - Alaska Sen. Ted Stevens, the Republican lawmaker convicted on felony corruption charges in October, appears to have lost his bid for re-election to Democrat Mark Begich, according to a release from Begich's campaign and unofficial results from state officials. The statement and results Tuesday come two weeks after the election, after absentee ballots were counted. With 100 percent of Alaska's precincts reporting, Begich, the mayor of Anchorage, had roughly 47.7 percent of the vote, compared with about 46.6 percent for Stevens, according to unofficial results posted on the Alaska Secretary of State's Web site. He appears to have bested Stevens by 3,724 votes, according to the posted results. 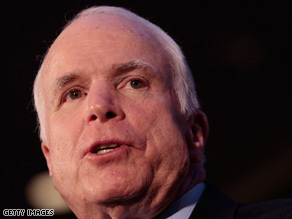 Sen. John McCain is looking forward to returning to the Senate full time, aides say. WASHINGTON (CNN) - Two weeks after losing his bid for the presidency in an electoral landslide, Sen. John McCain is beginning the thorny transition back to life out of the spotlight as he weighs his future role in the Senate. 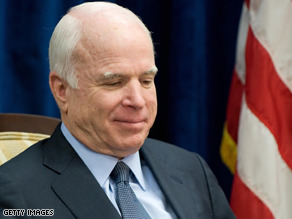 Aides say McCain is looking forward to returning to the chamber full-time after a nearly two-year hiatus. But the road from Republican Party standard-bearer to merely one of a hundred senators can be a bumpy one, political observers say, especially since the Arizona senator is without a leadership position as his party faces its slimmest minority in the chamber in nearly three decades. McCain's return to a lower profile is made more precarious by the fact that he has to grapple with a stinging public rejection and ongoing criticism from some Republicans who say his campaign was mismanaged. Other Republicans have said it was downright incompetent. Peter Orszag is a veteran of the Clinton White House. CHICAGO, Illinois (CNN) - President-elect Barack Obama has picked Peter Orszag, the head of the Congressional Budget Office, to head his Office of Management and Budget, a top Democratic source told CNN Tuesday. 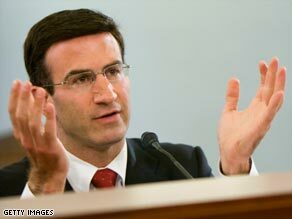 Orszag, 39, is an expert on health care, pensions and Social Security policy. A favorite of Clinton Treasury Secretary Robert Rubin, he and Rubin co-founded the Hamilton Project, an organization within the Brookings Institution focused on economic research and policy. Jason Furman, Obama's economic policy director, took over the Hamilton Project when Orszag left for the budget office in 2007. While at Brookings, Orszag also served as director of the Retirement Security Project and co-director of the Tax Policy Center, a joint venture with the Urban Institute. Orszag worked at the Clinton White House as special assistant to the president at the National Economic Council and served on the Council of Economic Advisors. Orszag is known in the halls of Congress for wearing cowboy boots with his business suit. McCain signaled he is interested in running for reelection in 2010. (CNN) - CNN has learned that John McCain met Tuesday night with top advisers to start the process of setting up a political action committee. A senior McCain aide says that was done to send the signal he intends to run for another term as senator from Arizona. He is up for re-election in 2010. The Bushes toured the Obamas through the White House Tuesday. 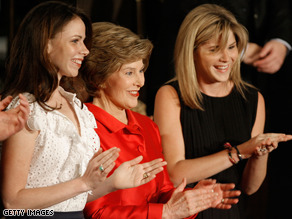 (CNN) - Jenna and Barbara Bush, the president's daughters, personally toured Barack Obama's daughters around the White House Tuesday, a White House spokeswoman said. The Bush daughters showed Malia and Sasha Obama their future rooms and other parts of their soon-to-be home, according to Sally McDonough, first lady Laura Bush's press secretary. WASHINGTON (CNN) - The lead sponsor of a bill to overturn the controversial Don't Ask, Don't Tell law said the law could conceivably be passed in the first year of President-elect Obama's administration. President-elect Barack Obama has pledged to lift the ban on gays serving openly in the U.S. military. "Although I have consistently said I would repeal Don't Ask, Don't Tell, I believe that the way to do it is to make sure that we are working through processes, getting the Joint Chiefs of Staff clear in terms of what our priorities are going to be," he said. A bill to replace "Don't Ask, Don't Tell", with a policy of nondiscrimination, has 149 co-sponsors in the house, including California's Ellen Tauscher, a Democrat. Tauscher said with new administration, the timing is right to try and pass the bill. "The key here is to get bills that pass the House and the Senate, that we can get to president-elect Obama to sign, and I think that we can do that, certainly the first year of the administration," Tauscher said in an interview with CNN. CNN has learned that President-elect Obama offered the position of Attorney General to Eric Holder, a veteran of the Clinton administration. (CNN) –Sources tell CNN’s Ed Henry and John King Barack Obama has chosen Eric Holder as his nominee for Attorney General. Holder has accepted the position but must still undergo a vetting process by the Obama transition team. If confirmed, Holder will become the first African-American to hold the position. Newsweek first reported the story. Stevens is not seeking a pardon. 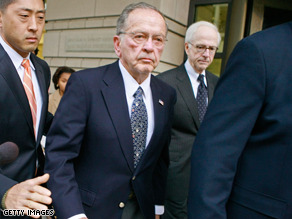 (CNN) - Sen. Ted Stevens, R-Alaska, who was recently convicted on seven felony counts, said Tuesday he won’t ask President Bush to pardon him. “No, no, no,” Stevens responded emphatically when asked if he would seek a pardon. The embattled senator, who turned 85 Tuesday, spoke briefly to reporters as he entered a meeting of Senate Republicans who were to decide whether he would be allowed to remain a member of their conference. “I wouldn’t wish what I’m going through on anyone, my worst enemy,” Stevens said in some of his first public comments about his ordeal since he was convicted last month of failing to report more than $250,000 worth of gifts from an Alaskan oil services company which renovated his house. “Look, I haven’t had a night’s sleep in almost four months. I went home even during the trial. I came to the Senate the night after the trial. So, I’ve been living like three different lives so it’s hard to even answer your questions but I’m doing my best,” he said. Election officials are still counting outstanding ballots to determine if Stevens will win re-election. His Democratic rival, Anchorage Mayor Mark Begich, is currently leading by a slim margin. Republican senators put off their decision about Stevens’ standing in the GOP conference until after its determined if he’ll be re-elected. CHICAGO, Illinois (CNN) - A source tells CNN that Barack Obama's presidential campaign raised $800,000 to help pay down Senator Hillary Clinton's debt from her bid for Democratic presidential nomination. An aide to Clinton says that the Senator from New York has $7.6 million in debt remaining from her primary campaign. Clinton was over $20 million in the red after she gave up her campaign and endorsed Obama following the end of the primary season in early June. About half of that figure was money she owed herself after loaning her own campaign over $12 million dollars. An aide to the president-elect says that the Obama campaign will disclose how much money they have left over from their run for the White House when the campaign files a financial report with the Federal Election Commission on December 4. It is still unknown who will replace Obama in the Senate. WASHINGTON (CNN) – President-Elect Barack Obama resigned from the Senate earlier this week setting off a mad scramble to fill the two remaining years of his six-year term representing Illinois. 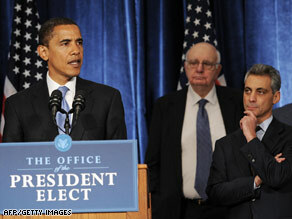 There is no clear successor in the wings and in the old school politics that shape the Illinois and Chicago landscape, Blagojevich will likely weigh several factors as he makes this decision notwithstanding his own possible re-election in 2010. Illinois Senate President Emil Jones Jr.